Though the existing building code has a provision that no buildings taller than 12 storeys can be built in Kathmandu Valley, the Kathmandu Metropolitan City has allowed a private company to construct a 16-floor tower at Purano Bus Park. 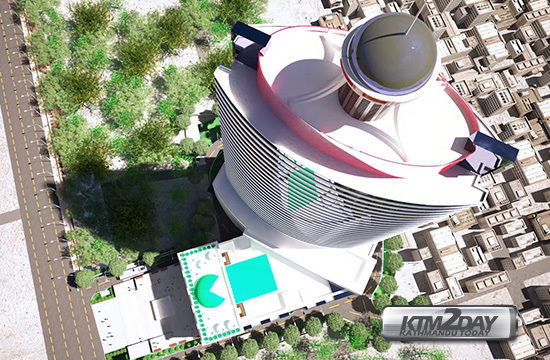 In January 2015, the KMC and a construction company signed an agreement to built the 29-storey Kathmandu View Tower. However, the magnitude-7.6 earthquake on April 25 in the same year not only halted the construction plan, but also forced the government to revise the building code and restrict the construction above 12 storeys. Since then, the company was lobbying for the approval for 29 floors as per the earlier contract. Now, the negotiations have reached almost final stage as the local government agreed to let the company add four more storeys on the existing standard. The KMC Public Private Partnership Section chief Mahesh Kafle says the building will have more than 12 storeys, but the exact number has not been fixed yet. But, a source at the company claims it has been fixed and the construction works will resume on September 1.